The Alfa Laval Aseptic Mixproof Valve ensures product safety and provides full protection against the intrusion of harmful microorganisms, even during unwanted pressure spikes. This double-seat mixproof valve is perfect for use in sterile process applications in the food, dairy and beverage industries. Easy to configure, operate, maintain, it reduces the total cost of ownership by up to 45% compared to other aseptic valves. Boost uptime, product safety, productivity and shelf life with the Alfa Laval Aseptic Mixproof Valve. It enables the simultaneous flow of two different products or fluids through the same valve without risk of cross-contamination. With its highly flushable design and no domes in the product and steam areas, this modular, easy-to-configure double seat mixproof valve makes cleaning and sterilization faster and more efficient than other aseptic mixproof valves. It also complies with the strict requirements of 3-A Sanitary Standards. 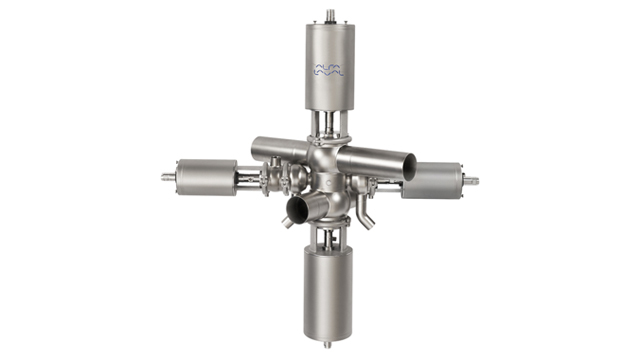 The Alfa Laval Aseptic Mixproof Valve shares the same versatile platform as the proven aseptic version of the Alfa Laval Unique Single Seat Valve (SSV). Configure the aseptic double-proof valve to meet virtually any requirement. Choose a standard valve body and a tangential valve body or use two standard valve body types. Then mount the valves in either a horizontal or a vertical position. Tailor the valve to your exact requirements by selecting the right actuator, seat lift, steam valve and options for steam temperature monitoring. Safeguard process efficiency and product safety while reducing costs with the Alfa Laval Aseptic Mixproof Valve. Its hybrid diaphragm with PTFE face and reinforced EPDM backing ensures the same proven hermetic seal that is found on the Alfa Laval Unique SSV Aseptic Valve. This drastically reduces the total cost of ownership for sterile processing compared to steel bellows-type aseptic valves. Maintenance is easy with the Alfa Laval Aseptic Mixproof Valve. Simply follow the same maintenance routines and use the same replacement parts as the Alfa Laval Unique SSV Aseptic Valve. This enables you to streamline your parts replacement inventory and save money. ISO 51 mm (2”), 63.5 mm (2.5”) and 76.1 mm (3”). Realize savings of up to 45% using the straightforward, reliable design of the Alfa Laval Aseptic Mixproof Valve instead of aseptic valves from other manufacturers. Longer service life, minimized product loss, greater product safety and more processing uptime make significant cost reductions possible. What’s more, effective CIP and SIP procedures reduce cleaning cycle times as well as consumption of cleaning fluids, water and utilities. The Alfa Laval Aseptic Mixproof Valve is a double-seat valve based on the same modular architecture as the well-proven aseptic version of the Alfa Laval Unique Single Seat Valve (SSV). It is comprised of a valve body, valve plug/diaphragm, actuator and cleaning options and accessories that support a broad range of process requirements. This diaphragm is composed of a PTFE face and reinforced EPDM backing, which create a hermetic seal to ensure sterile processing conditions. Built-in leakage detection enables operators to inspect the valve easily without having to disassemble it and to act immediately if action is required. This pneumatically operated aseptic double-seat valve is controlled from a remote location by means of compressed air. Aseptic and modular, it has few and simple moveable parts, which makes it a very reliable valve with low maintenance costs. An integrated valve plug/diaphragm secures aseptic operation. from one seal, the product flows into the leakage chamber and is discharged through one of the steam valves, which also acts as a leakage outlet. When main actuation takes place, the two product valves opens; the two steam valves must close to prevent product spillage. The sterile barrier is then moved from the leakage chamber to the backside of the plugs in the two steam valves. To clean the leakage chamber after main activation, you can utilize condensate to flush and when it is clean you add the steam to sterilize and generate the sterile barrier.